FTSE S-REIT Index declined 3.3% YTD. Sector yield spread over the benchmark 10-year SGS (10YSGS) yield remains below the -1SD level at 294bps. 3-month SOR crept up to 1.59% as at end June 2018, close to 10-year highs. Remain NEUTRAL on S-REITs sector. S-REIT yield spread compressed 30bps YTD in June. Despite the rise in the S-REIT dividend yield, the much larger rise in the 10YSGS yield YTD has led the yield spread to compress further to 294bps in June. This is below the -1SD range – historical average is 361bps. The 10YRSGS yield currently stands at 2.53%. Bloomberg consensus forecasts for the 10YSGS yield at the end 2018 and 2019 are at 2.62% and 2.88%, respectively. This will be a headwind for S-REITs. 3-month SOR near 10-year highs in June. Currently at 1.59%, the 3-month SOR is near 10- year highs. 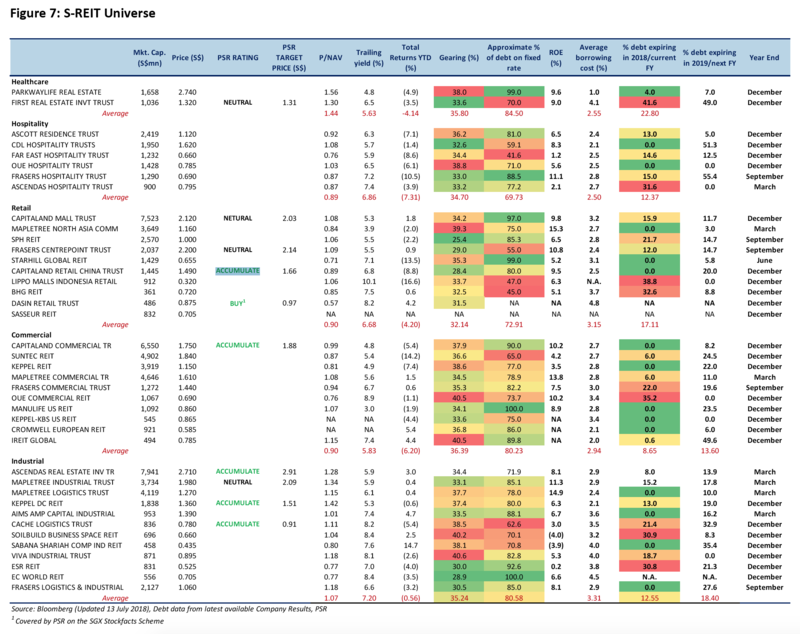 Flow-through to higher near-term financing costs largely mitigated as 31 out of 40 of all S-REITs, have at least 70% hedged against interest rates. Bloomberg consensus forecasts for the 3-month SOR at the end of 2018 and 2019 are at 1.78% and 2.17%, respectively. Retail sales (excluding motor vehicle sales) continued to be lacklustre with the Retail Sales Index inching up just 2.3% y-o-y in May. Competition for the consumer dollar remains intense. Taobao held its first home pop-up store in Singapore in June, which offered free local shipping on all items showcased. Amazon will also be launching its largest one-day sales event, Prime Day, for the first time here on July 16. Two major transactions were Capitaland Commercial Trust (CCT)’s divestment of Twenty Anson [see report: CapitaLand Commercial Trust - Portfolio Reconstitution Continues With Twenty Anson Sale] and Frasers Commercial Trust’s divestment of 55 Market Street. CCT had demonstrated effective capital recycling as can be seen from its higher entry yield from its acquisition of Asia Square Tower 2, which has a longer remaining lease and lower committed occupancy of 88%. Co-working concept continues to expand, with the opening of WeWork’s regional flagship space at 71 Robinson in June, just six months after establishing its maiden local presence at Beach Centre. Only upcoming Grade A Office supply this year will be 18 Robinson, which spans 145,000sqft. Against the backdrop of the ongoing merger & acquisition activity between ESR-REIT and Viva Industrial Trust, ARA Asset Management has acquired the remaining shares in the REIT manager and property manager of Cache Logistics Trust from CWT, thus ending the sponsor-REIT relationship between CWT and Cache. Hot on the heels was Mapletree Logistics Trust acquiring five modern, ramp-up logistics properties in Singapore from CWT for about S$778.3mn. These five properties were formerly in the right of first refusal portfolio from CWT to Cache Logistics Trust. Frasers Logistics & Industrial Trust is selling an Australian property for A$90.5mn (S$90.5mn). AIMS AMP Capital Industrial REIT will be spending S$13mn on enhancing its NorthTech industrial building in Woodlands. A hotel owner-operator mentioned that hotel occupancy levels were buoyant in May and June, partly stemming from the flock of tourists and journalists who arrived here for the Trump-Kim summit in June. Apart from the one-off event, we expect visitor arrivals to rise, albeit on a more gradual pace, following the heightened awareness of Singapore as a tourist destination post the Trump-Kim summit. We like the Commercial, Industrial and Hospitality sub-sectors due to tapering supply after the surge in supply in the prior two to three years. We are cautious on the Retail sub-sector as retail sales and shopper footfall both remain lacklustre, due to e-commerce competition. 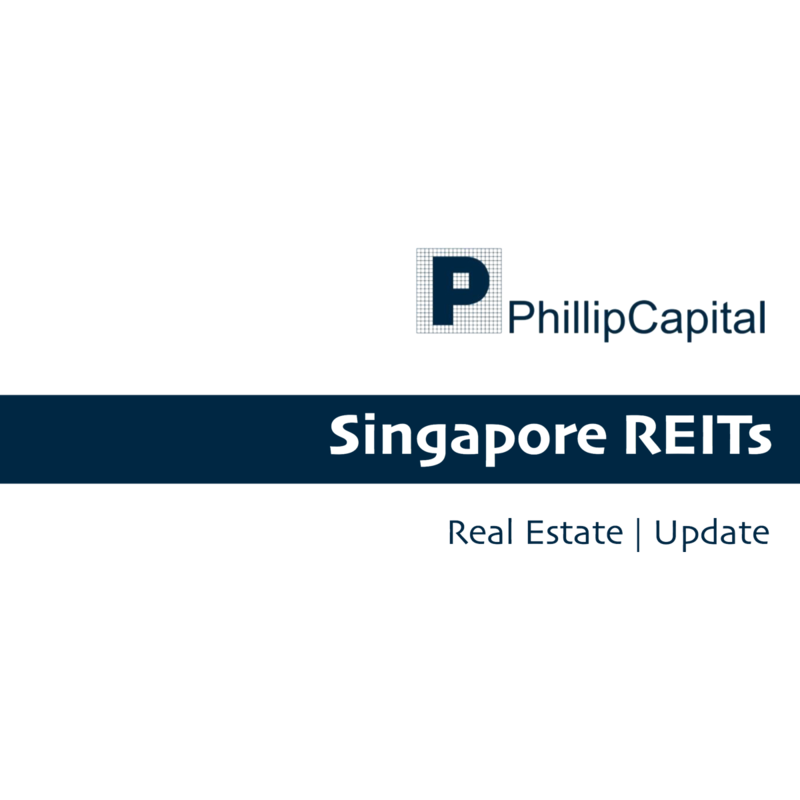 such as CapitaLand Retail China Trust (Rating: ACCUMULATE, Target Price:S$1.66), Frasers Logistics & Industrial Trust*, Ascendas REIT (Rating: ACCUMULATE, Target Price$2.91), and Keppel-KBS US REIT*. Ascendas Hospitality Trust is acquiring three hotels in Osaka, Japan from a third party, for JPY10,290mn (S$126.1mn), which will be fully-funded by debt. The CEO of Cromwell E-REIT’s Manager, Philip Levinson, has resigned. The CFO of Sasseur REIT’s Manager, Richard Tan Liat Chew, has retired and will be superseded by deputy CFO Fred Chee Kin Yuen. Mr Chong Kee Hiong, CEO and executive director of OUE Hospitality Reit's manager and trustee-manager, will be stepping down with effect from July 15.